Revising can be stressful and overwhelming. These 3 steps can reduce your stress and help you manage your time and workload effectively. Good luck! 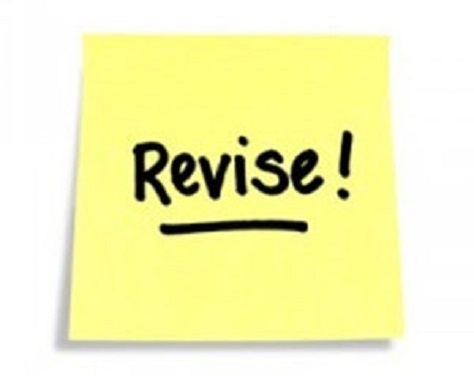 Draw up a revision timetable. Make sure it’s realistic for you. Don’t compare yourself to what others are doing – even if your friend has read Macbeth 14 times, don’t panic. Do what works for you. When do you work best? Are you an early bird or a night owl? Plan your timetable to take this into account. Do you need to sit at a tidy and ordered desk or do you prefer to sprawl out on the bed surrounded by your notes? Wherever is comfortable for you is the best place to be. No one can concentrate for 6 hours straight, so plan smaller chunks of revision and include lots of breaks. See the Pomodoro technique for some great tips on time management. Vary your timetable so that you don’t get bored. No one can survive 4 hours of flat out biology! Mix up the subjects so that your brain doesn’t switch off. It’s important to build some relaxation time into your revision timetable. Reward yourself – take regular breaks and plan some rewards. Maybe take the afternoon off to go to the cinema with friends. Allow yourself an hour of Netflix/Xbox/Playstation in the middle of maths revision. How about going for a walk before tackling history? Plan something to celebrate the end of exams with friends or family. Talk – Virtually everyone finds revision and exams stressful – there won’t be many of your friends who breeze through the coming weeks and months. So you aren’t alone. Share your worries with friends, family, teachers etc and get some support. Look after yourself – eat well, eat healthily with plenty of carbs to fuel your brain. Avoid tonnes of chocolate and litres of caffeine-heavy energy drinks – this will only make you more jittery and less able to concentrate. Exercise – Get outside and do something to clear your head, move your body and release any physical tension that has built up whilst you’ve been hunched over your books. Relax – If you are feeling stressed, find a calm and quiet place to sit and practice deep breathing or even try a visualisation. Try and get plenty of sleep and avoid staying up to the small hours revising. After a certain time at night, your brain just won’t be able to absorb any more information. If you have difficulty sleeping, there are lots of good tips on getting a good night’s sleep here. If you are finding things difficult to cope with, Westend Counselling can support you in the run-up to and during exams. Contact us here. Currently there are about four autistic boys to every one girl with autism. However, with the increasing knowledge of the causes of autism and increased understanding of the broad range of characteristics within the spectrum, it is recognised that there is an under-diagnosis of autism in girls. Girls are either being mis-diagnosed, or their autism is being missed altogether. The diagnostic tools used in the past are based on the male traits of autism and they don’t pick up the presentation of autism in girls. In addition, girls tend to mask their symptoms and therefore their difficulties aren’t so obvious. In some cases the girl may be diagnosed with anxiety, low mood, an eating disorder or OCD. Self-harming behaviour is a commonly used coping strategy for undiagnosed autistic girls. However, having to cope in a “one-size-fits-all” world which is overwhelming, confusing and unpredictable will lead to high anxiety and low mood and a strong sense of not fitting in and feeling different. How might autism present in girls and women? Autistic females can find it difficult to maintain eye contact, read facial expressions, socialise and keep up with the ebb and flow of conversation. Often, they will put on a mask, mimicking others and ‘shape-shifting’ their personality to fit those around them. Whilst doing this, there is the constant worry about whether they are getting it right, have they said the right thing, have they responded in the right way to a friend? Many girls will also experience higher or lower levels of sensitivity to one of the senses, such as sound, touch or taste. A girl may find certain noises so loud that it hurts and becomes overwhelming. Too much touch can result in sensory overload. Transitions and change can be difficult to cope with. It is common for girls to experience problems, and for the symptoms of autism to emerge or be stronger following a transition from nursery to primary, from primary to secondary school and then on from school to college, work or uni. These factors can lead to too much information – an overload of sensory input, information, emotions and feelings, resulting in a meltdown – crying, screaming, breaking things, head-banging, getting aggressive, swearing a lot, biting etc. Often the meltdown may be followed by a shutdown, when the girl withdraws and may need silence and darkness to help her recover. 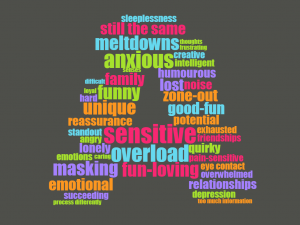 In a girl without a diagnosis of autism, these difficulties and meltdowns mean she can be seen as weird by her peers, finds coping at school/uni/college very difficult, and poses problems for her family in managing her challenging behaviour. A diagnosis of autism provides a framework for understanding the girl’s challenges, signposts a way forward in helping her cope, and helps her family understand and support her. If you would like to talk more about your daughter’s autism diagnosis, get some one-to-one counselling and coaching support for her, or you are worried about your undiagnosed daughter, please contact westend counselling here. Ok – we’re two months into 2018, and how long did you stick to your new year resolutions? Two days……, two weeks……., 5 weeks? We start off each new year with the best of intentions, only to beat ourselves up when we don’t lose that weight, pay off debt, get to the gym, get a new job, learn a new language…….., and generally become the perfect version of ourselves. Resolutions can feel like too much pressure – you’re not thin enough, you’re not fit enough, you’re not good enough. That’s because we often set ourselves targets that aren’t realistic and then we set ourselves up to fail. So instead, why not try a new kinder approach for the remainder of 2018 which involves no target weight, fitness level, tidiness of house etc. Instead choose ONE WORD which is going to guide and define you for the remaining 10 months of the year. It’s isn’t about doing, it’s about BEING. This word will guide you in your decisions and choices. It’ll inspire you for your ambition and actions. It’ll help your motivation, your thinking and how you feel. It’ll be your compass for the year ahead. So what could your word be? Maybe you need to DARE yourself at work – perhaps a promotion, a pay rise, a new project, speaking out at meetings, a new direction, career, study? Perhaps you need COURAGE to address a relationship, with family, friends or your partner? Can this year be all about FRIENDSHIP? Your word may help you reignite neglected friendships, develop new ones. Are you stuck in a rut and need to DISCOVER something new – whether that’s at home, at work, at play – a new sport, a new interest? Perhaps you could choose ENERGY to give yourself the boost you need? Are you a people pleaser and you’ve stretched yourself to breaking point? Do you need to QUESTION more and say no? Maybe you need BALANCE this year to restore the equilibrium in your life? Once you have your word, keep it in mind whenever you need to make a decision, choose a direction, take action. There are no deadlines, targets or goals to achieve. It’s your intention. Posted in new year	| Comments Off on Abandoned your new year resolutions? Try choosing ONE WORD for the rest of 2018……. Waiting for exam results can be a stressful time for your child and for you. Here are some tips to help before the day, on the day and into the future. 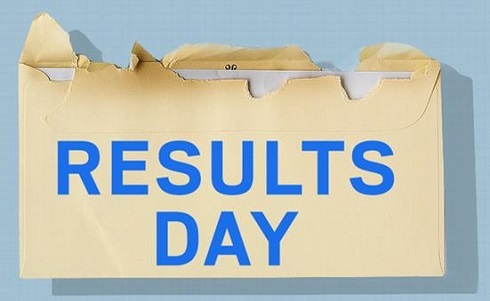 Your child may feel nervous and stressed in the week before results day. This may lead to difficulty sleeping, irritability, loss of appetite and anxiety or panic attacks. It’s really important that they can talk to family and friends about their worries and concerns. They may feel under pressure to achieve certain grades or meet other’s expectations of them. Reassure them of your support whatever their grades are. Talk to your child in the week before the results come in to anticipate how you may both cope with good or not so good news. Emphasise that they have your support and that you are proud of them even if the results aren’t what they expect. There is always a way forward for them, they just might not be taking the route that they had planned. It’s a good idea to talk about Plan B and what this could look like. This way, your child will be less anxious about the future because they can start to see that there is a way forward. 3a. On the day – and they are happy with their results. If you’re there, make sure that their success is recognised and celebrated. If you can’t be there, check who will be around for them – other family members, friends, school? Recognising their achievements will help them feel good about themselves and inspire them into the next steps for their future. Make sure they take a breather before they embark on their next step of more learning, studying and exam taking. 3b. On the day – and they are disappointed with their grades. If your child is disappointed with their results, they will need your support. They may be angry and tearful and want to be alone. Acknowledge this and allow them space, but also let them know you are there unconditionally to help them through the disappointment. Your child may be full of regret, constantly replaying what they did wrong or didn’t do right. These responses are natural and it’s important to recognise them and gently start to talk about options. Don’t rush into decisions for them – allow them time to process and think, and then Plan B can come into force. Importantly, do recognise the work they did do and the achievements they have got, even if they aren’t as high as they wanted. Encourage them to think about how they can learn from the experience and what they can do differently. 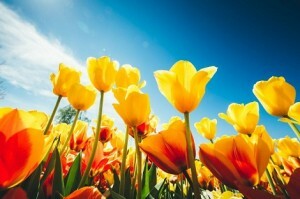 No matter whether the exam results were good or disappointing, life goes on. It can be all consuming at the time, but it is important to put things in perspective and remind yourself and your child of all the important people, achievements and qualities in their lives. Once you are through this period, take a deep breath and get ready to support your child onto their next step. If you or your child needs further support, contact westend counselling. There is further information from Family Lives on supporting your child through the exam results period. Taking exams can be a nerve-wracking experience. Here are some tips to help you manage your nerves so that you can do the very best on the day. If you haven’t slept well or at all the night before, don’t worry. Adrenaline will get you through the day much better than you think. Don’t worry if you really can’t manage to eat on the morning of an exam – your body will catch up. But do try to drink something to keep you hydrated. If you start to PANIC during the exam, here are some tips to help you calm yourself down and keep focused. Panic is the effect of the symptoms of anxiety. When you are anxious, your body produces more adrenaline, which causes a faster heartbeat, faster breathing, feeling faint, tense stomach etc, These symptoms are uncomfortable but they can’t harm you. See this great BBC video on stress and how to manage it. Stop, and take a few slow deep breaths to calm your body and slow your adrenaline down. Tell yourself you are feeling anxious but you will be ok. If you find you have a MIND-BLANK, or you are overloaded with information – try these tips. Take some deep, slow breaths and feel your body relax. Focus – take your mind somewhere else. Maybe count how many desks are in each row, how many people have brown hair, how many words can you make out of the letters of your name. This will calm your mind, focus it down, and then you can apply yourself to the exam paper. Take your time – read the questions over again slowly and pull out the main points. If things aren’t any clearer, then leave it for now and move on to the next question. Self-talk – you might start telling yourself “I can’t do this”, “I know I’m going to fail”. Replace these thoughts with positive ones like “It’s OK, I’m going to be fine” or “relax, concentrate and I’ll be OK”. Grounding objects – some people find it comforting to carry or wear something which is associated with a person or place. If you start to panic or feel stressed, touch this object and think about the person or situation. This can calm you down and help you regain your focus. Don’t focus on what you think you did wrong, or on the question you didn’t complete. Instead, remember how much you did answer and what you know you got right. Try to avoid an exam post-mortem with your friends. Going over what you wrote, and comparing your answers to your friend’s answers, can only make you feel anxious. It’s too late – you can’t go back and change what you wrote. Instead, enjoy the feeling of one more exam ticked off. If you do feel you have messed up, talk to family, teachers or friends and talk through your options. 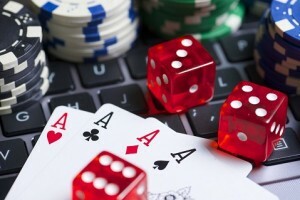 A re-sit may be possible, or the consequences of a lower mark may not be too drastic. Some extra tips are here in short videos from BBC Radio 1. Everyone experiences ups and downs in life. It is usual and normal to feel anxious, unhappy, stressed or depressed when things are difficult and challenging. This is a normal part of life. Low mood tends to improve after a short time, by resolving issues or problems, talking things through, taking action and getting support from those around you. 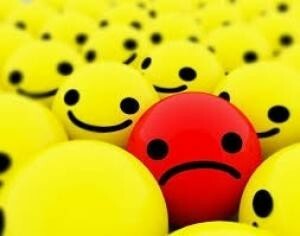 However, if low mood doesn’t pass, it may be a sign of depression. If you recognise many of these symptoms and they are persisting for weeks or months and impacting on your family, work, health and social life, then it is time to seek some help. Talk – to your friends and family and let them how you are feeling. Talk to a support agency like the Samaritans, available 24 hours/7 days a week. Contact your GP – they will assess your depression and recommend a way forward for you. If your employer has an EAP (Employee Assistance Programme), access their support services. Contact a private counsellor. Cognitive Behavioural Therapy has been shown to be effective in treating depression. Find a qualified and professional counsellor near you on the Counselling Directory. Contact westend counselling to chat through whether CBT would be helpful for you, and to arrange an appointment. Use the Wheel of Emotion to help you understand how you feel. Start in the middle of the wheel, and pick the label that best fits how to feel and work outwards through the spokes and stop when the label makes the most sense of how you feel. Then say that word, to yourself or out loud. The feeling won’t disappear but nor will it overwhelm you. You now know what you are feeling – accept this feeling and don’t judge yourself. With this new understanding you can start to work out more rationally what you need to do to manage that feeling. 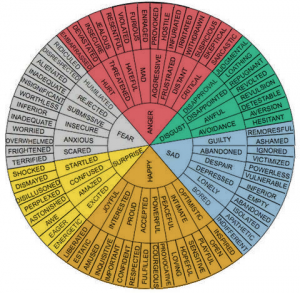 Posted in emotions	| Comments Off on The Wheel of Emotion – helping you understand what you feel. Sometimes you can feel such a mixture of physical and mental hurt that it can be overwhelming. Finding a way out, or a way to control how you feel can be difficult, and imagining that you can feel differently, impossible. This is where labelling your emotion can help, by helping you understand how you feel and therefore helping you to take control. Research studies asked participants to give a label to their emotion such as “anger” or “fear”. They found that labelling led to less activity in the part of our brain which controls our fight-or-flight response (the amygdala) and increased activity in the thinking part of the brain. So what does that mean? The psychologists suggest that labelling takes us from an emotional state to a thinking state – “you seem to be putting the brakes on your emotional responses”. This allows us to act less impulsively and to take control of our feelings. So, how to name our emotions? If you are struggling to label how you feel, there is a great tool called the Wheel of Emotion. Start in the middle of the wheel, and pick the label that best fits how to feel and work outwards through the spokes and stop when the label makes the most sense of how you feel. 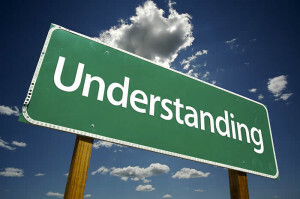 With this new understanding you can start to work out more rationally what you need to do to manage that feeling. For example, if you learn that you are feeling angry, perhaps you need to go out for a walk, talk to a friend or speak to your partner about the issue which is troubling you. 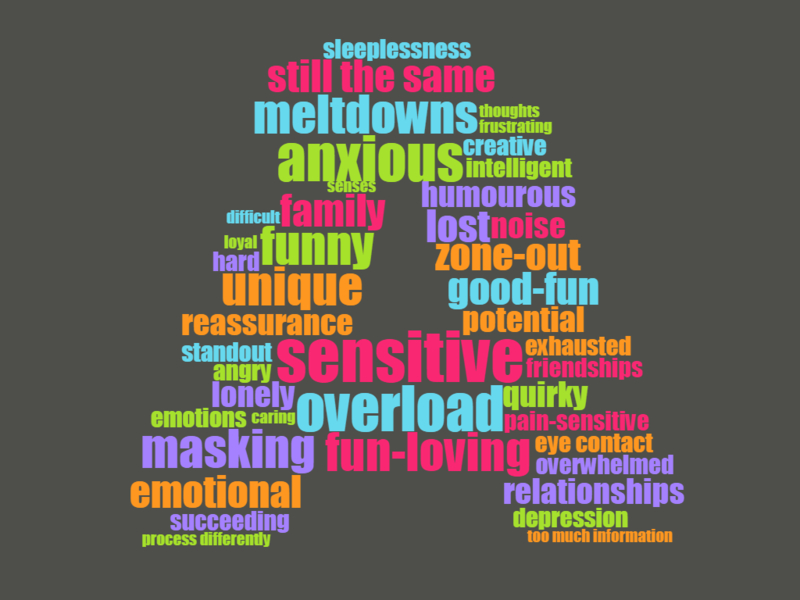 Labelling and accepting how you feel will help you manage distress in the future. For anyone with prelims coming up in the New Year – here’s a guide to making the most of your revision time. 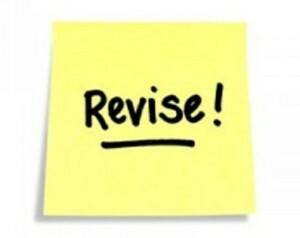 Draw up a calendar plan of what you are going to revise, when. Tie it into your exam timetable so that you are focusing on the right subject at the right time. Make sure you build in plenty of down-time too – take whole days off to enjoy Christmas and Hogmanay, and then you’ll feel fresher when it’s time to get back to the books again. 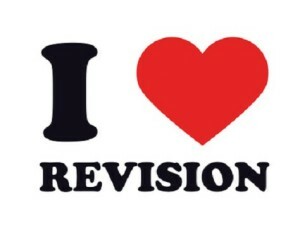 Spreading your revision throughout the holiday means that there is time to do enough and do things repeatedly. This means that the information will transfer into your long-term memory where it stays committed, until you are ready to retrieve it. Cramming doesn’t work – information only gets into the short-term memory which I read is like “the party space in your head – information is there for a good time but not a long time”! Test yourself regularly because this will let you know whether the information you’ve been learning has been remembered and you can retrieve it. There are past papers free on-line on the SQA website for Scotland and on the exam board websites for England. Sleep allows your brain to process the day, and therefore process the information you’ve been learning. It’s important to get enough sleep to embed this information and also to feel fresh when you start revising all over again the next day. If you are finding it hard to sleep, some tips are here. All-nighters don’t work! Your ability to remember and process information is very limited as you get tired. And research has shown that it can take up to 4 days for your brain to recover back to normal after being deprived of sleep. Research shows that taking regular breaks rather than working continuously for hours is more effective for learning. You don’t succumb to distractions so easily and can therefore concentrate more. For a great time management tip, try working for 25 minutes and then taking a 5 minute break to check your phone, listen to music, grab a drink, take a walk around the house, watch Youtube. More information is here. It’s important to do something else. Even better is taking some exercise. Exercise releases a whole bunch of hormones which can impact on learning, mood and concentration. Try anything that gets your heart pumping to feel the benefits. Get together with friends if you are struggling to understand or learn an important concept. Talk to friends, share what knowledge you have and teach each other. For anyone needing individual support with stress, revision technique or exam anxiety, contact westend counselling for one-to-one sessions. Posted in exams	| Tagged exams, stress, time management, worry	| Comments Off on How to get the most out of your study time.